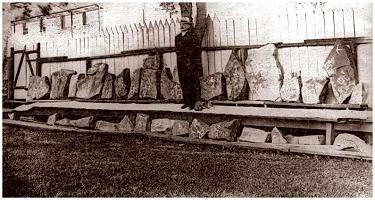 Charles Bennett, one of the founders of Pipestone, stands with the Petroglyph slabs that he had removed from the Three Maidens area in the 1880's. 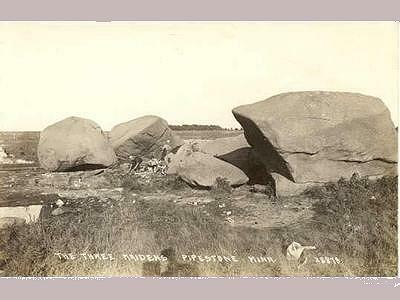 An early photograph of the 'Three Maidens' area, before the commercial mining started next to it. 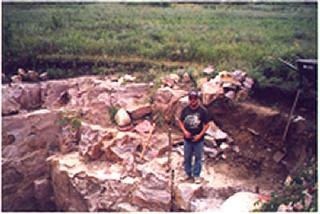 This is where the Petroglyphs were located. This is George Catlins painting of the 'Three Maidens'. 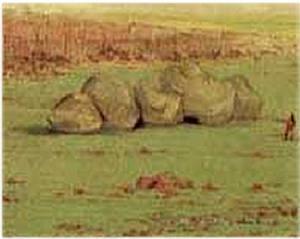 These are granite boulders that were deposited in Pipestone when the glacier's melted. One of the larger quarries in 2000. Only one man works in this pit, and he has to do a lot of hard work to get through all of the quartzite that you can see. This is again a large quarry, known as the Cooperative quarry. 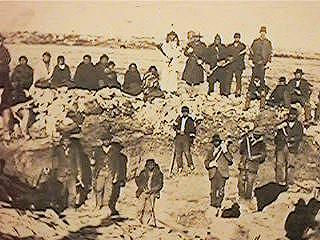 It was worked by many people who travelled together from their reservation to work. These were probably Yankton quarriers and the date is early 1900's. These are the tools that are used in the quarrying process. They have not changed, if you look in both of the above photos you will see the same tools. Moses Crow, who was the first Dakota person to reside in Pipestone. 1927. He married the young woman in the next photo who is standing on the left. Ancestors of the Derby family. The lady seated, their great, great, grandmother, was in Pipestone with her family, when she was 12, quarrying in 1862 when the Dakota Conflict started. The same group in a more formal pose. Unusual Museums of the Internet? 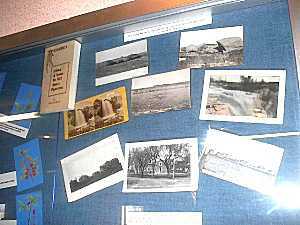 PAGES OF ITEMS IN THE MUSEUM: Photographs and other historic items.